Tonight I'm drinking Big Sound Scotch Ale brewed by Cigar City Brewing in Tampa, Florida. 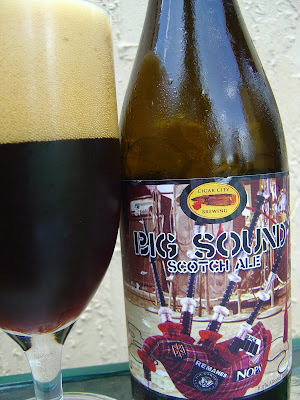 I think this was the second beer to make it down my way in SE FL, only after their Warmer Winter Winter Warmer Ale. So I've been sitting on this one for a while, and we've had half a dozen others since I purchased this one. Not sure why I was waiting, but it never seemed like the right time. Until tonight! The wine-sized bottle is cool, but without the story on the back, you'd have no clue what everything means. Unless of course, you are in their cool Tampa clique. Mainly, you are viewing plaid-covered bagpipes decorated with strange band stickers. REMANES sticks out oddly. Finally you will discover that this beer is dedicated to Punk Rock Bagpiper buddy Gino, who plays with the Tampa Bay Pipes and Drums. 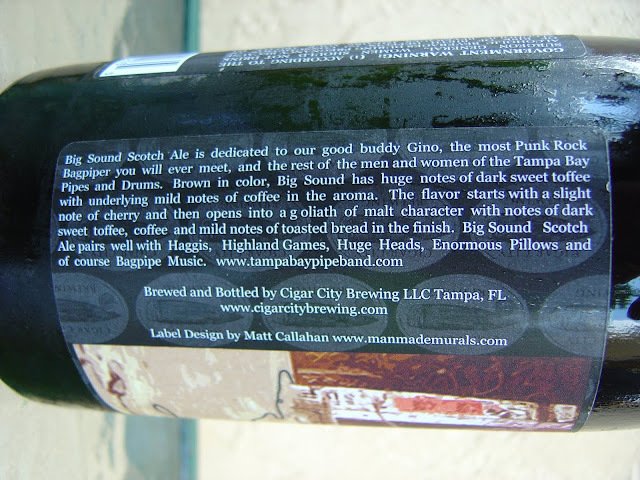 Label design by Matt Callahan at Man Made Murals.com. Big Head! That was probably partially my fault, see the picture, but it was definitely aggressive despite my pour. Caramel aroma, rich, sweet and inviting. Sweet caramel and toffee flavors start things off. Some toasted nutty flavors come in to play shortly afterward, slowly taking away a little of that sweetness. So far, rich and thick, luscious, creamy, smooth. Having a full wine bottle to figure this beer out, you start to taste some chocolate and light spiciness in the background. It also took me a while to pinpoint one other flavor--Fig Newtons. And once identified, it was perfectly clear. The 8.5% alcohol is complexly intertwined and really works well with all the flavors, and actually also helps to balance the initial sweetness. By the end of the bottle, the toasted toffee and Fig Newton flavors are really persistent. They were and remain sweet, but you will never think this beer was too sweet (you = me). Great carbonation, too, which you probably figured from my opening statement. Excellent beer! My favorite in this style by a long shot! Visit me and we'll split a bottle. I promise. Fig Newtons! Of course! Damn I had a hard time figuring out that flavor, and you're spot on. A great beer. I agree with your review 100%. Yeah, it took a little while to figure it out, but that chewy fruity figgy doughy flavor finally tapped me on the shoulder. :) Glad I didn't just say "dark fruit". LOL. Yeah, I bet those bag and pipe bands get all the chicks! Haha, pillow biscuits? Really? I like our name better. Anyway, it was quite the intriguing flavor.